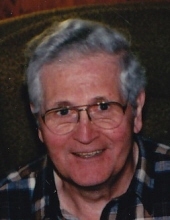 Elmer W. Brummel, age 98, a lifelong resident of Naperville, IL, passed away on Monday, February 11, 2019 at St. Patrick's Residence in Naperville, surrounded by his family. He was born November 26, 1920 in Naperville. Beloved husband of Joan M. Brummel (nee Koretke), whom he married April 4, 1945 at SS. Peter & Paul Catholic Church in Naperville, loving father of Kathleen (Deacon Ron) Yurcus of Glen Ellyn, IL, Carol (Jerry) Hinterlong of Somonauk, IL, Kenneth (Pat) Brummel of Hayward, WI, William (Cindy) Brummel of Aurora, IL, Karen (Randy) Portelli of Louisville, KY, Joann (Glen) Griessler of Naperville and Janet (Rick) Gawron of Oswego, IL, adored grandfather of twenty, cherished great-grandfather of thirty, devoted son of the late Peter and Julia (nee Lenertz) Brummel, dear brother of the late Walter (the late Rose) Brummel, Vincent (the late Leona) Brummel, Florence (the late Bud) Dannewitz, Carl (the late Marge) Brummel, Bob (the late Bernice) Brummel and Theresa (the late Don) Oester, fond uncle, great-uncle and friend of many. Elmer grew up on his family farm on Butterfield Road in Warrenville and was a 1939 graduate of Marmion Military Academy in Aurora, IL. Elmer went on to farm in the area where White Eagle subdivision in Naperville now exists. He later worked as a fuel oil driver for Grush Oil, Naperville and for DuPage Precision Co., Naperville. Elmer was a longtime member of SS. Peter & Paul Catholic Church in Naperville and a former member of St. Irene Catholic Church in Warrenville. He was also a member of the DuPage Farm Bureau. One of Elmer’s passions was music. A saxophone player, he played with his siblings, Vincent and Florence in the “Beau Brummels”, a group which played dancehalls and weddings in the area. Elmer also enjoyed bowling. Visitation Sunday, February 17, 2019, 1:00-5:00 PM at Friedrich-Jones Funeral Home & Cremation Services, 44 S. Mill St, Naperville, IL. Additional Visitation will be held Monday, February 18, 2019, 9:00 - 10:00 AM at St. Patrick's Residence, 1400 Brookdale Rd., Naperville, IL. A Mass of Christian Burial will follow Monday, 10:00 AM at St. Patrick's Residence. A luncheon will immediately follow the funeral mass at the SS. Peter & Paul Church Ministry Center in Naperville. Family and friends will meet Monday, 2:30 PM for committal services at Marywood Cemetery, Aurora, IL. To send flowers or a remembrance gift to the family of Elmer W. Brummel, please visit our Tribute Store. "Email Address" would like to share the life celebration of Elmer W. Brummel. Click on the "link" to go to share a favorite memory or leave a condolence message for the family.